We love this mattress set. We purchased it for a guest bedroom and have had no complaints since it arrived! It is very comfortable and sheets fit very nicely. I would purchase it again. 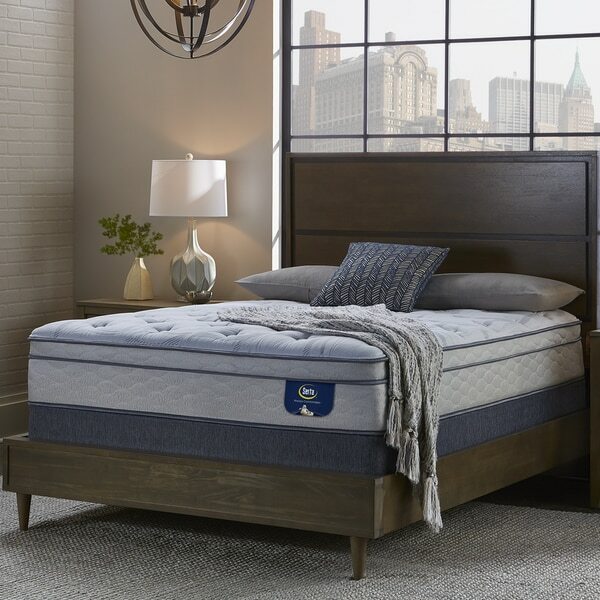 Bring extra comfort and support to your sleep cycle with this Serta Perfect Sleeper Bristol Way II Supreme Gel Eurotop Mattress Set. The mattress features a continuous coil design with Twist Gel memory foam for a combination of support and plush comfort. The deluxe mattress includes one box spring foundation. I purchased this bed from Overstock.com about a month ago. Wasn't too sure about the gel top since I am used to the memory foam topper. I was also not sure about purchasing a bed online. After a month, I can honestly say that I am very satisfied with my purchase. The bed is not quite as firm as I would've liked but overall I would definitely recommended to others. I've been an Overstock.com customer since 2003 and their White Glove delivery service was excellent, except they do not offer Satuday delivery. Also, couldn't beat the price. This bed was comparatively priced *** and I got the same bed AND a Biopedic Gel Memory Foam Body Pillow ALL for ***, via an Overstock.com email alert. Would've missed this great buy if I had not signed up for the Overstock.com's email alerts. Looking forward to decorating my next home through Overstock.com! I am extremely pleased with this mattress. Like most other viewers, I was also hesitant about ordering a mattress online without trying it out but decided to buy anyway based on the positive reviews. It's very soft but also very firm, as everyone has stated. However, it is quite thick! My bed has risen by probably at least 4 inches so it's a bit difficult to get on top now. The description says it's 12 inches thick but it's definitely more. Be prepared to buy a deep-pocket sheet set. Bed was actually a few inches off from a king size. The foundation if not positioned right would fall right through the king size frame. My king size bed sheets were a few inches too wide. Way too soft and the bed itself actually made noise whenever you moved. Terrible purchase but luckily overstock customer care is great and got it returned for me. After looking for years we decided on this mattress. It is awesome. Firm but comfy. To be honest the first 2 weeks were not very comfortable, I was tossing and turning. But now it's great. We found a few similar sets at the furniture store for around $1800. This mattress and foundation are so comfortable that I may purchase another set. Easy to buy. Happy that 2 men showed up and installed plus took the old one away. Gold service. Product well built,soft but yet slightly firm. Memory gel fitting your body works great. Happy about purchase. Purchased after much thought and reviewing. Great buy. Very comfortable bed. Medium firm w a soft top. Definitely recommed. Less back pain. I brought this set, looking for a firm mattress with a little give. This one is perfect. I love the gel top. It is very comfortable. NEVER BOUGH A MATTRESS SET ONLINE BEFORE BUT THIS SET IT'S HOLDING OUT PRETTY GOOD FOR THE LAST THIRTY DAYS WHEN I PURCHASED. IT VERY COMFORTABLE AND SOFT..MY BACK FEELS A LOT BETTER...A NICE DESIGN TO IT AS WELL. THANK YOU OVERSTOCK! This is a really comfortable bed, I'm very pleased with it in that respect. But it has a terrible smell that I'm not having much luck getting out of the mattress which is really bothersome. It makes my sheets and pillows smell bad. Overstock's customer service was very good, I complained about the smell and they replaced the mattress for free. Unfortunately the new mattress has the same problem. Its very comfortable but despite airing it out for days at a time the smell persists. Just slept on the new mattress last night and was surprised. Didn't wake up with any aches or pains. Mattress is firm but has the cushion on top to relieve pressure points. When I ordered this I thought I might need an additional topper but I'm glad I didn't order one because this mattress is fine on it's own. Not the prettiest mattress I've ever owned but that's not what mattress. Now just hoping this mattress lasts. Plush yet firm, my first memory foam, I love it. This is my first experience with a pillow top mattress and I enjoy it so much. I'm a big guy and I was worried about sinking and sagging however the Euro Top with memory foam performs very well, it gives me the best of both firm and plush. Sagged within a month....thinking about throwing it away. Avoid! I just threw it in the trash! GARBAGE! Springs broke down in less than a year, had to get rid of it.. I wouldn't suggest this bed to anyone and the warranty is no help at all! Excellent mattress. Very comfortable. Very soft/plush. No need for a topper. Have had it for about 4 years and haven’t had a bad night of sleep on it. Has lasted a long time as well. This is exactly what I needed to upgrade my sleep. I LOVE it. Highly recommend this purchase if you want to sleep better. The fact that it's pretty affordable compared to others. Very comfortable. We would recommend this product to a friend. SO SO comfortable. Was worried buying a mattress online / from overstock but it exceeded my expectations. Very comfortable, not too hot, and great balance of softness and firmness. I purchased this mattress set for my guest room and have received nothing but compliments on how comfortable the mattress is. I have referred many to overstock to purchase and when I say overstock, they are literally floored. Perfect for a guest room. "Does the king size mattress come with a split box spring?" "Can this mattress be flipped? Does not appear so. Also: Do you have a hypoallergenic cover to fit the queen size?" I bought this mattress, and it cannot be flipped. Don't know about the hypoallergenic cover..
No, it cannot be flipped. "Does the Serta Perfect Sleeper Bristol Way II Supreme Gel Eurotop Split Queen-size Mattress Set have a split boxspring? Is the mattress also split?" "Does the Serta Perfect Sleeper Euro Bristol II come with a Bristol II Boxspring or a Wayburn box spring? " "Does the serta perfect sleeper Bristol II come with a Bristol II box spring or a different kind? " "Is this one big California king size mattress or 2 singles put together?" "was the question answered? We have a platform bed and don't need a box springs. " This mattress comes with the foundation. You are not required to use the foundation however.